Teacher Tom: "It's Not A Drum"
As clean up time approached, I began to survey the two-year-olds, "Is it clean-up time?" Some said, "Yes," while others informed me that they wanted to wait "Three minutes" or "Five minutes." They all know by now that after we tidy up we go outside. I've never instructed the children to participate in cleaning up, but I have instructed the parent-teachers in this cooperative class to practice stepping back, to leave space for the children who choose to participate to do so in a meaningful way. After three or five minutes, I retrieved the hand drum we use as a transition signal. Children were engaged in their play all around the room, although a couple of them stopped what they were doing to notice me. I said, "I'm getting the clean-up time banjo," and proceeded to "play" it like a banjo. A few more kids noticed me. "It's not a banjo," I said, "It's a flute," and I played the drumstick like a flute. "It's not a flute, it's a trumpet," and I played the stick like a trumpet. Now several more children were watching me. One of them laughed, saying, "It's a drum!" "It's not a trumpet," I continued, "It's a trombone," and I pantomimed playing the stick as a trombone. "It's not a trombone, Teacher Tom! It's a drum!" By now about half the kids had dropped what they were doing to watch me. "It's not a trombone, it's a tuba." I used the drumstick for the mouthpiece and held the drum over my head to represent the large, flared tuba bell. 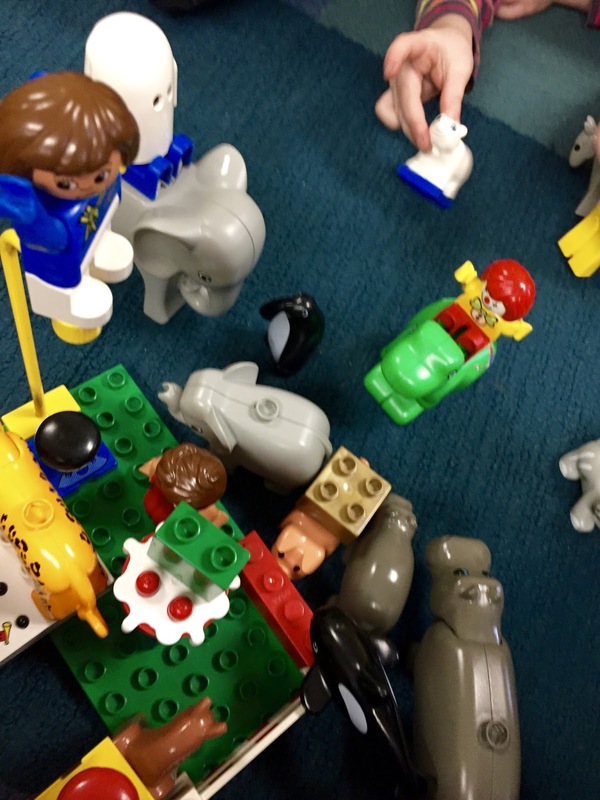 By now, most of the kids were paying attention, and most of them had come over to where I stood on our checker board rug to stand amidst the Duplos that were scattered there. Several of them shouted at me, "It's a drum!" and "It's not a tuba!" I said, "It's not a tuba, it's a harp." "It's not a harp!" they shouted. "It's a drum!" Some were so full of anticipation that they demanded, "Bang it!" "It's not a harp, it's a piano." "It's a drum!" "Bang it!" "It's not a piano, it's a drum and I'm going to bang it so loud that your brains are going to shoot out of your ears and splat on the wall." By now everyone was focused on my silly little show and they were demanding that I bang the drum. They were demanding the transition. It's not the first time I've done this, indeed, it's part of my regular teacher repertoire. After a couple of goofs where I pretended to miss the drum, I finally made contact, playing it gently with three soft beats because they were all so focused with anticipation that that was all I needed. As I said, I've never suggested that these two-year-olds participate in clean-up, although they have by now been coming to class since September and many of them have been pitching in of their own accord for months. Yesterday, however, the sound of Duplos being dropped into boxes was almost deafening, as they all, as one, leapt to the task. There were a couple visitors in the room at the time, mothers touring the school with an eye toward enrolling for next year. The response was so dramatic, so instantaneous, so opposite of the stereotype we have of young children, that I couldn't help making eye-contact with one of the prospective parents boastfully, as if to non-verbally say, Surely, you want your kid to be a part of this! I then continued to make informational statements like, "That box needs to go over here," and "Phillip is putting away lots of blocks," and "We need help at the red table," until everything was packed away. None of them complained. None of them hid. None of them sought to avoid the "work." They simply did what we were doing until it was done, then we put on our coats and went outside.